What can you do with the course equivalency system? Before submitting a new course equivalency request: 1) Search the database to make sure that the course does not already have a prior decision rendered; 2) Have the course syllabus ready in PDF format. Once your request is submitted, you will be issued a request number, sent an email with your request details, and your request will be automatically sent to the appropriate reviewer. When requesting the evaluation of a course for equivalency at McGill, the course syllabus documentation must include information on the items below. The full name of the prior university or other educational institution (an identifiable logo may provide the necessary identification in some cases.) Documentation obtained from a website must include the URL of the source. The syllabus must show the date (term and year) the course was taken. Performed singly, or in pairs or groups of what number? Ensure the documentation indicated is completed and saved in single PDF file format. In order to submit a new course equivalency request, you must ensure that the course does not exist in the database and that you have the course syllabus ready in PDF format. See the FAQ section below for details on how to convert an online course syllabus to PDF. How can I use the information in the database? The information found in the database indicates previous equivalency decisions made by academic advisors for students who have taken courses at partner institutions. The information can be used to help you with your academic planning when going on exchange or studying abroad. Please be advised that you must check with your program and faculty advisors to obtain approval in order to apply a particular equivalency towards your degree and program requirements. You can search the database using one or more parameters. At a minimum, you must search by country or course information. For optimal results, we recommend that you enter as many parameters as you can to narrow your search. If there are no results found, you can broaden your search by reducing or changing your search criteria. How do I search for courses in a particular subject? To search for all equivalencies in a particular subject, for example all Psychology courses at McGill, enter PSYC in the course number field and click on 'Search'. This search will display all PSYC course equivalencies at McGill reviewed against courses at other host institutions in different countries. To narrow those search results to a particular country, click on 'Refine Search' and select the country for which you wish to narrow results. Should I include spaces or special characters when searching for courses? No. You must omit special characters and blank spaces when entering the keywords. For example, when searching for ECO.12-13, you must enter ECO1213 in the course number field. How do I interpret a course equivalency record when there is more than one course listed? 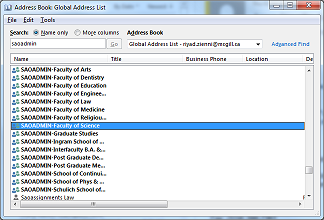 In this example, a student must take the two host courses, GEM1ELM092 and GEM1ELM136, for them to be equivalent to BUSA462 at McGill University. In this example, taking the host course 6163 would be grant the student equivalency for the two McGill subjects MGPO434 and BUSA433. Why can’t I find a university/college in the database? Only universities and colleges that have course equivalency decision records are listed in the database. Why can’t I find a course in the database? Only courses that have a course equivalency decision (e.g. equivalent, not-equivalent) are stored in the database. Also, make sure you are ticking off the 'Include Expired Decisions' box, as the course you are searching for might have a prior equivalency decision that has since expired. How do I view details and navigate the tool? Once your search has yielded results, you can hover your mouse over a record to view additional information and click in the course equivalency to view the details (e.g. decision or comments if available). To view previous page results, click on the 'Back' button. For best results, use Chrome, Firefox, or Safari web browsers. How do I submit a new course equivalency request? In order to submit a new course equivalency request, you must ensure that the course does not exist in the database and that you have the course syllabus ready in PDF format. See below for details on how to convert an online course syllabus to PDF. Once your request is submitted, you will be issued a request number, sent an email with your request details, and your request is automatically sent to the appropriate reviewer. How do I convert an online course syllabus to PDF? There are many ways to create a PDF document, including the use of third party software such as CutePDF or Bullzip and printing to PDF using Microsoft Office. How can I request a reassessment of an expired equivalency? All course equivalencies expire after their designated time. Once the decision expires, the course must be re-evaluated again to determine whether it is equivalent or not. I want to add to my Transfer Credits Assessment form a course whose equivalency decision expires this (current) term but it won't let me. What do I do? How can I verify that my request for an equivalency was processed? Your equivalency request will be evaluated by the appropriate reviewer. Once the reviewer records his/her decision and the decision is finalized, you will be sent an email automatically notifying you that a decision was made. You will then need to search the database to verify whether the decision rendered indicates equivalent or otherwise, as well as what other conditions you might need to fulfill. How can I apply for transfer credit after obtaining equivalency decisions? Whom should I contact if I encounter errors or the service is unavailable? Please contact the IT Service Desk if you encounter errors with the Course Equivalency tool or if you are unable to access the tool. Whom should I contact if I have questions on how to navigate the tool? For students questions on how to navigate the tool, contact Service Point. Whom do I contact to verify whether an equivalency can be taken for credits or as an exemption? Credit and/or exemption will not be awarded until official final results are received and students obtain program and faculty approval. Students visiting McGill must obtain approval for any credit and/or exemption from their home institution. Please contact your program or faculty advisor for information. Consult the Advisor Directory. How do I view pending course equivalency or assessment confirmation requests? The course equivalency management system has two reviewer roles: 1st Reviewer and 2nd Reviewer. Note: Depending on the faculty requirements, there may not be any 2nd reviewers for a particular McGill subject. How do I process a request when there is not sufficient data to assess it? There are occasions when an equivalency request may not have sufficient information to be able to determine whether the host course is equivalent or not (e.g. the attached course syllabus file is corrupted or the wrong course syllabus was attached). In those cases, you can submit the request back to the requestor with information on how to correct the issue without recording a decision in the database. How do I assess a course equivalency request? Additional Steps: These steps must be followed when you deem necessary to have multiple courses taken to be equivalent to one course or vice versa. Example: You are assessing a request that Course BIOL2000 at Concordia University be Equivalent to BIOL402. After reviewing the request, you determined that the course can only be Equivalent to BIOL120. Instead of publishing your decision as BIOL2000 Not Equivalent to BIOL402, it is best to be published as BIOL2000 Equivalent to BIOL120. How do I change a reassessment request from “Many - One” course equivalency or vice versa? When is a course equivalency decision published in the database? Some faculties require a given subject to have a 2nd Reviewer. If this is the case, a course equivalency decision is published after the 2nd Reviewer has confirmed the 1st Reviewer’s decision or has submitted a different one. In the event that there is only a 1st Reviewer role assigned to a subject, the decision made by the 1st Reviewer is automatically published after clicking on Submit. Requests that are processed as “Incomplete” are not published in the Course Equivalency Database. How can I correct course equivalency decision information after a decision is published? You need to contact a System Administrator to alter a course equivalency decision after is is published. You can do so by sending an email to ceqadmin [at] mcgill.ca along with what you need changed (including course numbers for McGill and host institution) and why it needs to change. How do I add/remove/modify reviewers? 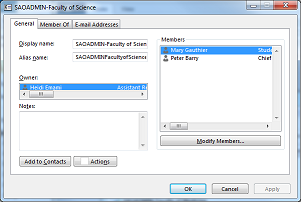 You must be assigned as a Faculty Administrator to be able to add/remove/modify reviewers. Why are there no results found when searching to add a reviewer by email or name? Make sure you search by official first and last name or the McGill email address. Resource accounts and preferred names are not searchable. You will only be able to search for current McGill staff. Why am I getting an email about course equivalency requests? It is possible that you receive an email notifying you that there are course equivalency requests pending. This only occurs if there are McGill subjects which you administer that do not have a 1st reviewer assigned to them. To stop those emails from being sent to you, assign a 1st Reviewer for each McGill subject for which you are responsible. When should a 2nd reviewer be assigned? A 2nd Reviewer is not needed to be able to assess and public course equivalency decisions. Some faculties or departments may require that a 2nd reviewer validate the decisions made by the 1st Reviewer and any accreditation requirements. How do I view a list of all Faculty Administrators?